Aram Davidian is one of a group of Armenian refugee orphans who made the trip from Corfu, Greece to a new home in Canada, at a farm in Georgetown, Ontario. And like the others, Aram is delighted with the beauty of his new home and the kindness of the people taking care of them. But adjusting to a new home isn't easy. None of the Canadians speak Armenian, and the boys are left to puzzle out their hosts' bewildering language and customs. While Aram can't really understand why they must eat the steamy mess called porridge every day, he and the other boys are delighted by the strange candies and fruits they have never experienced before. Slowly they must learn that it isn't necessary to horde their food; more comes every day. There is so much to confuse and delight. They cannot understand why their Canadian host wants them to stand under water coming out of a wall when they can just jump in the pond to get clean. But the ice box and stove are wonders of modern life. Despite the many pleasant distractions, Aram misses his young friend, Mgerdich. Injured on the long journey to Canada, Mgerdich is alone in a hospital in France. And what is more disturbing is that Aram and the other boys have been given new names, English names, to go by. If they are forced to discard their Armenian names, how will their extended families find them again one day? Even the final arrival of Mgerdich does not cheer up Aram, who cannot explain to his young friend why he must have a new name. As much as they want to forget the hardships and tragedies of their past lives, the boys can't understand why they must give up their identities. With a little help from an Armenian translator, Aram at last has the chance to thank his kind hosts for all their care and explain why he and the others must always keep their names. 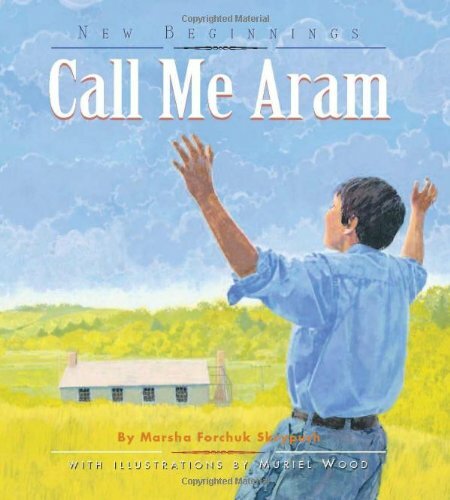 Call Me Aram is the sequel to My Name is Aram, which was nominated for the Silver Birch Award and the CLA's Children's Book of the Year Award. New Beginnings is a series of historical chapter books for newly independent readers between the ages of eight and eleven. Each novel concerns a boy or girl facing the challenges of adapting to life in a new culture in North America. Every New Beginnings title is well researched, illustrated in full color throughout, and accompanied by an index and glossary. About Muriel Wood (Illustrator) : Muriel Wood is a published illustrator of children's books. Some of the published credits of Muriel Wood include Call Me Aram, Aram's Choice (New Beginnings (Fitzhenry & Whiteside)).